A gargantuan war machine, the Reaver Titan is one of the most common and destructive classes of Battle Titan. Armed with devastating weapons and able to crush enemies under its tread by the score, the ground shakes as the Reaver advances and the enemy is left with a choice: flee or die. Reavers are the heart of the Titan Legions, holding the line or leading the charge as their Princeps demand.The Reaver Titan forms the mainstay of most Titan Legions, and is a key component of many Adeptus Titanicus maniples. 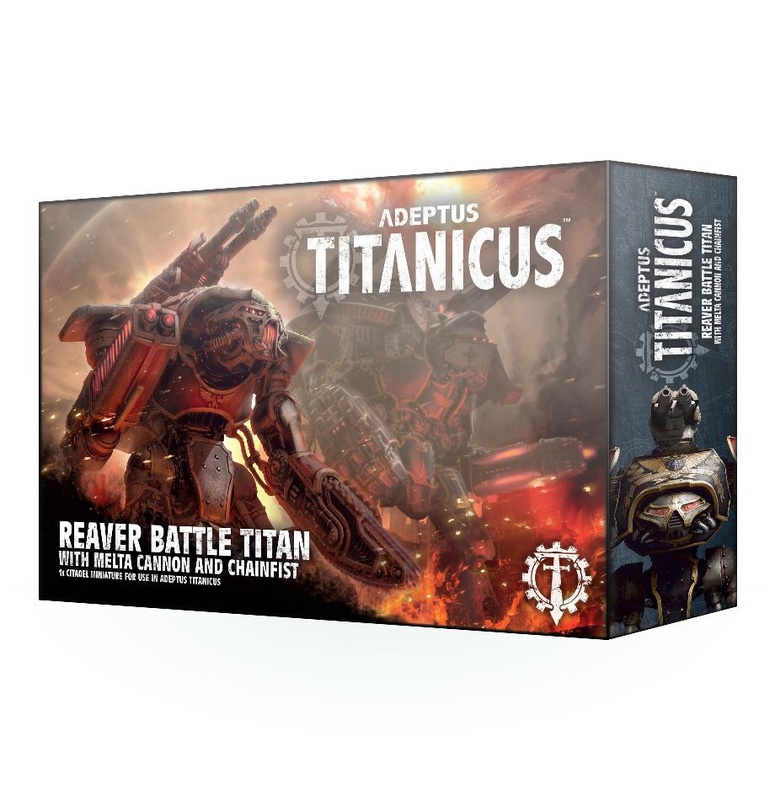 Swifter than its Warlord cousins and more durable than the smaller Warhounds, with a wide range of devastating weaponry, the Reaver Titan is the perfect addition to any battlegroup.This multipart plastic kit contains the components necessary to assemble a Reaver Battle Titan for use in games of Adeptus Titanicus. Particularly aggressive-looking, even compared to its contemporaries, this highly-detailed Titan is easily recognised by its flattened face profile and angular carapace.It comes armed with several weapon options – a melta cannon and volcano cannon are available, alongside a chainfist. Above the carapace – of which 2 are included, 1 blank – resides a turbo laser destructor, either side of which are the shoulder pads (3 sets are included – 1 set loyalist, 1 set traitor and 1 set blank). Further modelling options include the knee pads – 2 of these are blank, with 1 depicting the symbol of the Opus Titanicus.This kit is supplied with a Citadel 105x70mm Oval base along with a decal sheet – this features heraldry for the following Legions: Gryphonicus, Fureans, Astorium, Atarus, and Mortis. Cerastus Knights are employed as weapons of extermination, designed to inspire fear in their foes. Nothing will sway their attack until the enemy is utterly crushed, never to rise again from the flame-scoured ruins of their strongholds.This multi-part plastic kit contains the components necessary to assemble 2 Cerastus Knights for use in games of Adeptus Titanicus. Each of these machines is armed with a Cerastus shock lance and an ion gauntlet shield. 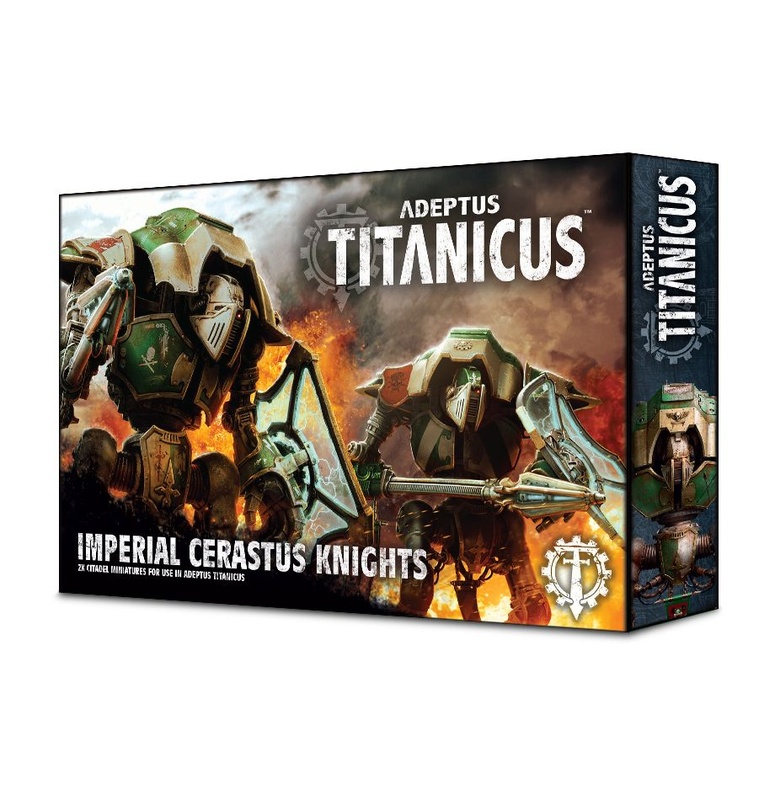 These are highly detailed Adeptus Titanicus-scaled miniatures are every bit as impressive to behold as their larger brethren – included are 6 heads of 3 different designs, allowing you to add some variety to your Cerastus Knight banners. This kit comes as 58 components and is supplied with 2 Citadel 50mm Round bases along with a Cerastus decal sheet that features heraldry for Houses Makabius, Vyronii, Malinax and Coldshroud. The bestial appearance of the Warhound Scout Titan reveals its purpose to the enemy – a savage hunter in the vanguard of the Titan Legions. Despite its size – still towering over tanks and Knights – the Warhound carries an astounding array of formidable weaponry, proving more than enough to bring down most foes it might face; when fielded as a maniple, combining their firepower in a devastating salvo, Warhounds can be trusted to change the face of a battle in seconds. 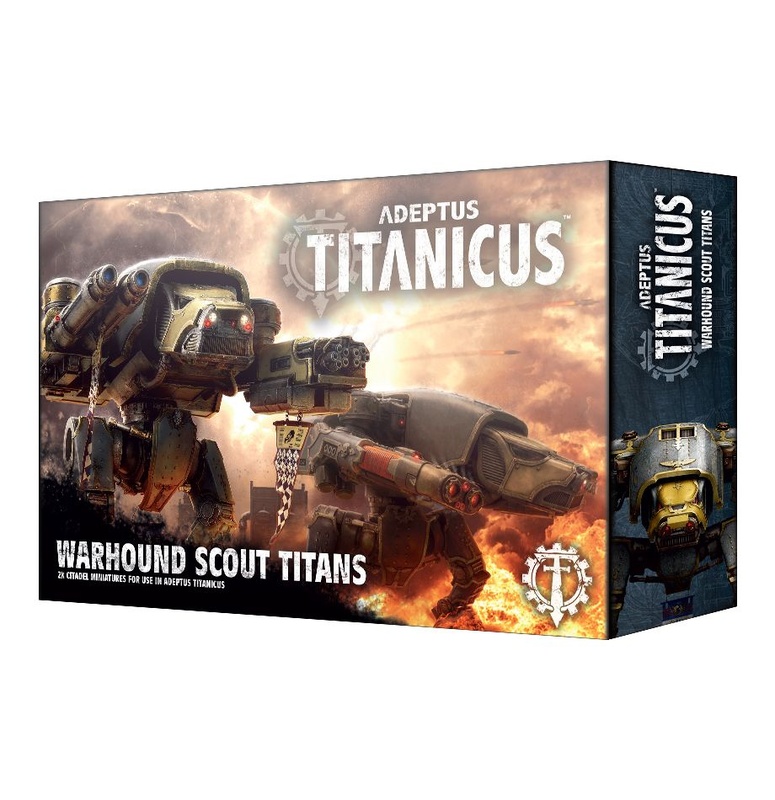 This multipart plastic kit contains the components necessary to assemble 2 Warhound Scout Titans for use in games of Adeptus Titanicus. Hunched forward, its carapace and head providing it with an exceptionally aggressive and purposeful profile, the Warhound Scout Titan is easily distinguished from its brethren by its uniquely canine head, which sits level with the weaponry attached to the hardpoints on either side. The rest of the Titan is relatively spartan – designed to move quickly rather than stand in a single place – while still far from lightweight. The kit includes 4 different heads, 4 different carapace designs (2 Loyalist, 2 Traitor), shoulder assemblies with Traitor and Loyalist icons available and 3 different sets of greaves – an Imperial eagle design, an Opus Titanica design and a plain set. A small amount of poseability is available, as the waist can be turned to provide the illusion of movement. Either Titan can be armed with a pair of plasma blastguns, turbo laser destructors, vulcan mega-bolters or inferno guns – 2 sets of each are included, with associated pipework for attaching the weaponry to the Titan’s hardpoints. This kit comes as 124 components, and is supplied with 2 Citadel 80mm Round bases along with a decal sheet – this features heraldry for the following Legions: Gryphonicus, Fureans, Astorum, Atarus, and Mortis. The galaxy is in flames. The Emperor’s glorious vision for humanity is in ruins, his armies locked in brutal civil war. The greatest of these bitter combatants are the towering god-engines of the Adeptus Titanicus. Those Titan Legions that remain loyal to the Emperor of Mankind fight boldly to stem the tide of treachery, holding the line on countless worlds as the Warmaster’s forces advance inexorably on Terra. The Traitor Titan Orders march at the vanguard of the Warmaster’s hosts as they seek to bring the Imperium to its knees in the name of their twisted cause…Adeptus Titanicus: The Horus Heresy is a tabletop game of devastating combat between awe-inspiring machines, set during the civil war that tore the galaxy apart. 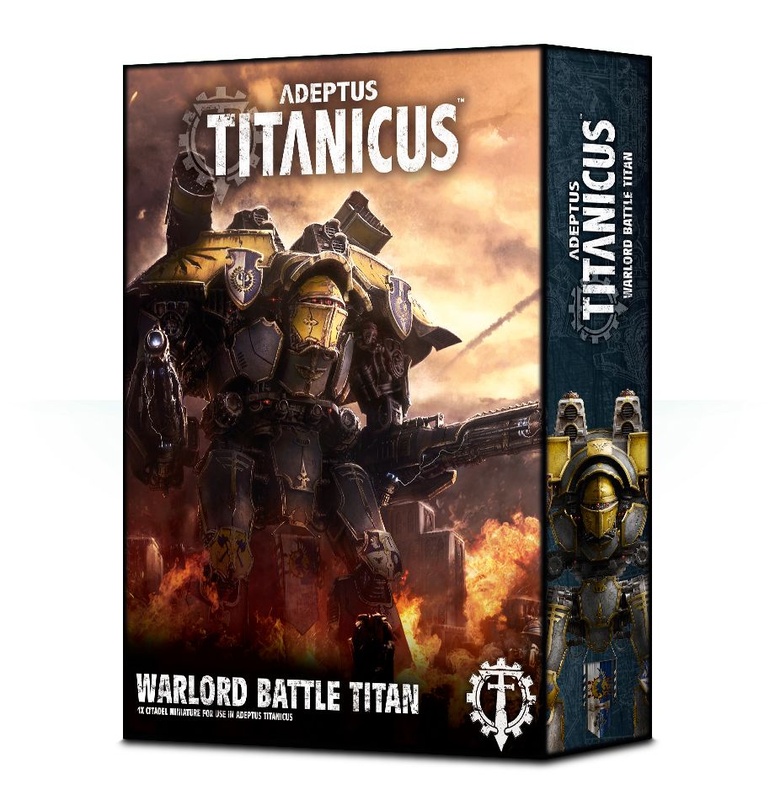 2 players take control of a variety of Titans – colossal, bipedal war engines covered in thick armour and weapons which can level a city in a single salvo. It is a strategic challenge in which you pit your skill and cunning against your opponent in a battle to the death; a test of tactical skill demanding the management of the resources at your disposal, determining the optimal reactions to the evolving state of the battlefield.Contained within the packed box of the Grand Master Edition, you’ll find:Rules & BackgroundA comprehensive 96-page rulebook is included, featuring rules Basic, Advanced and Optional for play, along with detailed background on the Titan Legions, their creation and battles prior to – and during – the Horus Heresy:- The Imperium of Mankind: while no complete archive of the history and events that shaped Mankind’s ascent to galaxy-spanning rulers exists, archaeodata can be used to piece together information on the Empire of Old; the relationship between Terra – the seat of the Emperor – and Mars, home of the Cult Mechanicum; the Unification Wars and Great Crusade; the Collegia Titanica and the creation of the Titan Legions; and the shattering civil war of the Horus Heresy. Such information is presented here;- Selected Notable Engine-wars of the Age of Darkness: when the god-engines go to war, the galaxy itself holds its breath – here is a record of numerous conflicts between these towering machines, from the Betrayal at Isstvan III, the Death of Tallarn, through to the Imperial Muster at Beta-Garmon;- Throughout the book are presented annotated schematics and blueprints of a variety of Titans, along with examples of composition, heraldry and colour schemes of Knightly Banners and Titan Maniples;- Rules Introduction: Adeptus Titanicus features an incredible amount of depth and detail to its game system, with the Advanced Rules being a comprehensive guide to piloting a Titan – the Introduction section of this book is designed to ease you into the way this game is played, with annotated photographs demonstrating the setup, showing a battle in progress and clearly explaining how each accessory – the Command Terminals, dice and arcs, particularly – is used;- Basic Rules: covering everything players need to know in their first few games, this section explains Rounds – between 4 and 6 per game – and the 5 Phases – Strategy, Movement, Damage Control, Combat and End – of which each Round consists. Each Phase is explained as an overview, with suggestions of Advanced Rules to add as you become more familiar with the game’s flow. 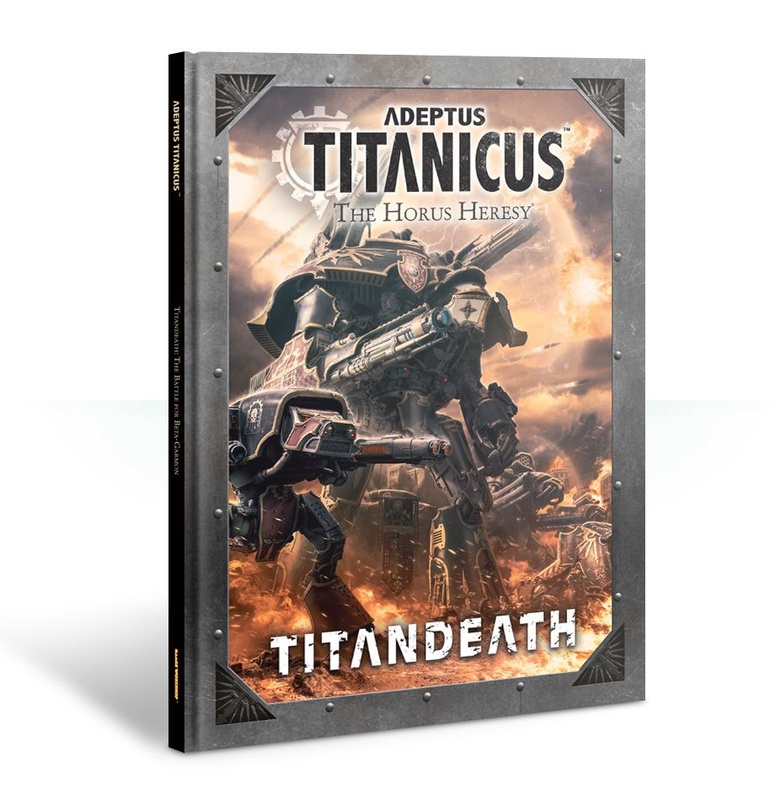 Included is a mission – Titanic Clash – designed for use with the Basic Rules;- Advanced Rules: once players are familiar with the Phases and flow of Adeptus Titanicus, it’s time to step up and begin piloting your Titans with Advanced Rules. This section introduces Stratagems, which are special abilities defined by the mission being played, and the issuing of Orders, which confer a bonus – and a concurrent disadvantage – to your models. Terrain effects are introduced here – even the god-machines can run into difficulty on a rubble-strewn battlefield – as well as the effects of pushing your Titan’s Plasma Reactor; while this provides you with more power for cataclysmic salvos of fire, it also drastically increases the chance of a dramatic overheating scenario. A canny Princeps understands how to manage this risk! As well as this, there are rules for Awakening the Machine Spirit, an unpredictable and unusual set of conditions which can be set by the vital force at the heart of each Titan, overriding the crew’s wishes in ways which can prove advantageous. Finally, this section provides rules for fielding squadrons and banners, supporting one another with coordinated strikes and overlapping void shields;- Optional Rules: while not necessary for a game, the rules in this section can be used to add complexity and depth for those who really want to triumph over the adverse conditions found when trying to guide a Titan to war. Overloaded void shields, destroying terrain, management of the very routing of power systems, and dealing with the consequences of stray shots are all covered here;- Assembling a Battlegroup: advice on assembling your Titans into a battlegroup, with maniple configurations and personality traits for your battlegroup’s leader;- Fighting a Battle: 3 different ways of enjoying the brutal combat and evolving stories you’ll act out while playing are outlined here – Narrative, Matched and Open Play. Open Play concentrates on the models themselves, with no restrictions – simply place whichever Titans on the board you wish, and fight; Narrative Play uses missions to tell a story, and Matched Play balances the sides to make games pure tests of strategic ability. 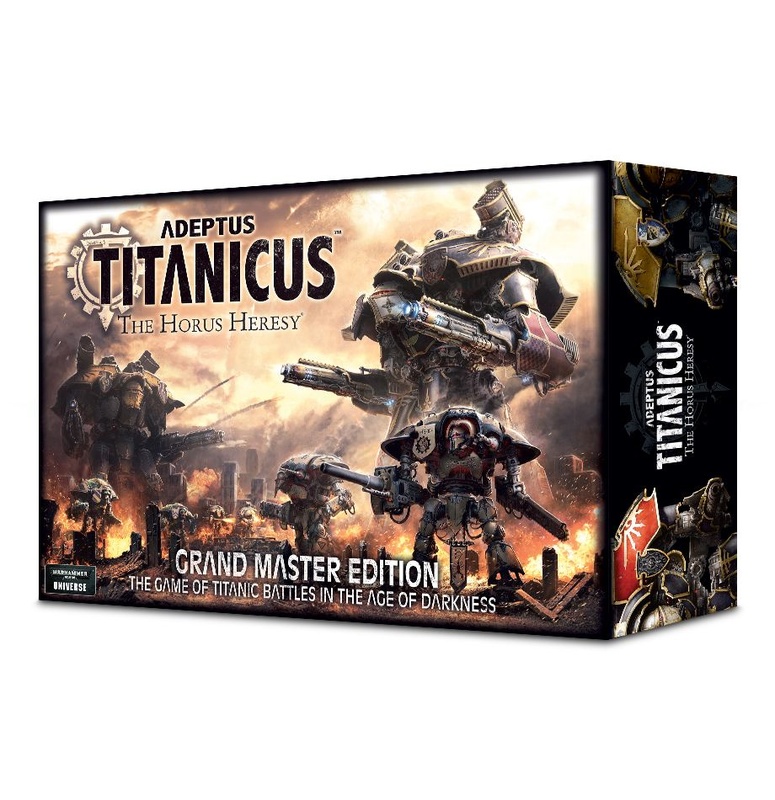 6 missions are included, with advice on designing your own;- Legions of the Adeptus Titanicus: descriptions and rules for Legio Gryphonicus and Legio Tempestus, each with its own Legion Trait, specific wargear, and choice of Princeps Seniores’ Personal Trait.Miniatures8 spectacular plastic miniatures are included in the box – 6 Imperial Knights and 2 Warlord Titans. These kits, the Warlord Titans especially, feature an incredible level of detail that belies their size, featuring a richness and posability that will reward the patient hobbyist with a fine result. Included:- 2 Warlord Battle Titans: standing approximately 6” tall, these representations of the colossal god-engines are unbelievably detailed and posable. Each is made up of 144 components – the advanced hobbyist will find that the hip, knee and ankle joints can be modelled in virtually any position imaginable. each Warlord Battle Titan boasts 2 volcano cannon, which are an integral part of the arm assemblies, and 2 carapace-mounted apocalypse missile launchers. Each Titan also features a choice of 2 heads, Great Crusade and Age of Darkness armourials (with blank examples) and a transfer sheet including heraldry for the following Legios: Gryphonicus, Fureans, Astorium, Atarus, and Mortis;- 6 Questoris Knights, split across 2 sets of 3: each of these machines is armed with a reaper chainsword, with a thermal cannon, rapid fire battlecannon, avenger gatling cannon and 6 heavy stubbers available (2 of these stubbers can be optionally replaced with a meltagun.) Decal sheets are included, featuring the heraldry of Houses Makabius, Vyronii, Malinax and Coldshroud;- A set of Adeptus Titanicus buildings: specially designed for the scale of Adeptus Titanicus, this is a set of detailed plastic buildings used as terrain and line of sight blockers in-game. Entirely modular, this set can be used and re-used to make a variety of configurations – up to and including a single tower block, should you so desire. In total, it comprises 8 frames of components, including wall and roof sections covered in fans, vents, archways and windows and numerous buttresses.AccessoriesThere is included a host of gaming accessories necessary for playing Adeptus Titanicus:- 6 Titan Command Terminals: 2 Warlord Titan, 2 Reaver Titan, and 2 Warhound Titan Command Terminals, large card surfaces used to track the status of your Titans during games;- 2 Questoris Knight Command Terminals, used to track the status of your Knight Banners during games;- 28 Titan Weapon cards: these double-sided cards are placed on the Titan Command Terminals in-game to keep track of the weaponry you’ve deployed, with one side showing the weapon characteristics, and the reverse showing that it is disabled;- 24 Mission and Stratagem cards: these detail the 6 Missions and 18 Stratagems from the rulebook in a handy small format;- Battlefield Assets and Status Markers: Battlefield Assets are a frame of 6 plastic miniatures, used to represent certain Stratagems – this set includes 1 Macro Cannon Battery, 1 Apocalypse Missile Strongpoint, 1 Command Bastion, 1 Plasma Generator, 1 Communications Relay and 1 Void Shield Relay. Also included are markers for initiative, a wrecked Titan head which can be used as an objective marker, 50 status markers for use with Command Terminals, 6 designation markers for the Titans on the battlefield and 3 arc templates used to determine weapon firing arcs;- 2 reference sheets, quickly detailing the Phases of the game along with at a glance information on Orders, Repair Actions, Hit Roll Modifiers, Armour Roll Modifiers, rules for Smash Attacks, Reactor Overload table, Awakened Machine Spirit table, Catastrophic Damage table, Damage Effects, Critical Damage Effects, and Common Weapon Traits;- 21 Adeptus Titanicus dice: 1 D6 Reactor Die, 1 D6 Hit Location Die, 2 Numbered D10, 6 D6 Order Dice, 10 Adeptus Titanicus D6, and1 Scatter die;- 2 clear blast markers and a flame template, representing explosions and fiery bursts in-game. Warlord Battle Titans bestride the battlefields of the Imperium, their thunderous tread heralding the destruction of the enemies of Mankind. A mainstay of the Collegia Titanica, Warlord Battle Titans are among the largest and most powerful war machines ever devised by the Mechanicum. Standing approximately 6” tall, this representation of a colossal god-engine is unbelievably detailed and posable. It is made up of 144 components – while it is possible (and easiest) to assemble this miniature in exactly the pose depicted on the cover of the comprehensive assembly guide found in the box, the advanced hobbyist will find that the hip, knee and ankle joints can be modelled in virtually any position imaginable. As a result, no 2 Titans ever need be built in the same pose, and the details – pistons, hydraulics, exposed machinery and power systems, ventilation – can be truly admired. The components for the Warlord Battle Titan are split between 3 frames: 1 featuring the inner skeleton, leg and torso assemblies that build the main structure, 1 frame of carapace and armour plates that give the Titan its distinctive shape, with Great Crusade and Age of Darkness armourials allowing you to display your models’ allegiance (blank examples are included) and a frame of weapons – a Warlord Battle Titan boasts 2 volcano cannon, which are an integral part of the arm assemblies, and 2 carapace-mounted apocalypse missile launchers. The kit also features a choice of 2 heads. This kit comes as 144 components, and is supplied with a Citadel 120mm Oval base. Included is a transfer sheet with heraldry for the following Legios: Gryphonicus, Fureans, Astorium, Atarus, and Mortis.